Commingling standard and nonprofit mail is an easy way to save money on postage. MDI now has its very own operation and has completely automated the process, using the most sophisticated equipment available today. Commingling is the process of taking mail from multiple clients, combining all of the mail pieces, and distributing them to the closest SCFs and BMCs. (BMCs are now referred to as NDCs, “National Distribution Centers”). By merging the mail together, we achieve a greater zip code penetration level that optimizes postal savings for every client. We sort millions of pieces of mail every day, using proprietary state-of-the-art technology, thus enabling us to give you the best possible rate. 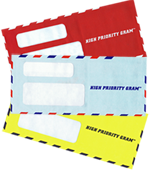 And while you are saving money, your mail will be delivered with a greater level of accuracy, speed and consistency. And we don't just commingle the mail we produce at MDI. We will also pick up your mail produced at other facilities, Monday through Saturday, 6 days per week. Please give us a call today, and we'll schedule a pick up and get you on your way to achieving big postage savings!